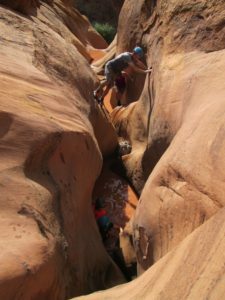 We loved visiting Moab, Utah, and I wrote reviews on some terrific outings from our trip there. But of course there are more stories behind those reviews, so here are a couple of them. First, as we drove into Moab, J took in the craggy red landscape and said, “These hills look like Chicken Tikka Masala.” Okay, yes. I sort of get that. It’s definitely beautiful. We pretty much exhausted ourselves in Moab. 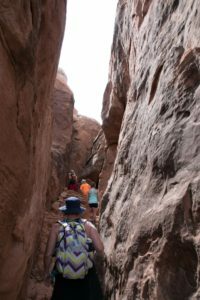 We’d already been vacationing for a week before our arrival, and we had packed our few days in Moab with some serious fun. We arrived in the evening to a beautiful lightning storm, woke up early for a hiking-and-rappelling trip, dragged the half-asleep children to check out the sunset at Canyonlands (they perked up), and woke up early the next day for a phenomenal overnight rafting-and-camping trip. We left the raft guides and arrived at a new hotel just after lunchtime feeling tired, sun-soaked, and dirty. 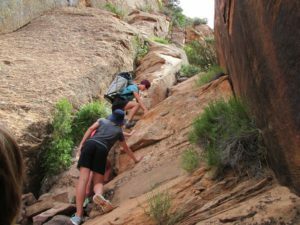 But we only had limited time to take turns showering and cat-napping before an afternoon excursion with Moab Desert Adventures that, I swear, was described as an easy, light, fun little excursion. As we attempted to rally at the hotel I was thinking that it was a good thing that this was going to be easy. I was thinking that it was likely that anything besides napping was probably too ambitious for us. I was wondering if perhaps we should back out and regroup. But I am so glad that we didn’t. Marie must have taken this photograph for us, because we’re all in the photo. It’s a skinny little channel within stone that’s been cut by water, and the floor of the canyon is brown-red water that matches the landscape. As we went along, we could often choose whether we wanted to wade in the water at the bottom or climb along the top. In this photo, M’s in the lead in the water, wearing a blue helmet, and J’s splashing right behind her wearing neon orange and a grey helmet. Cute W is just about to start “bridging” his way across, which means he’s going to move perpendicular to the slot, walking his hands along one wall and his feet along the other wall. And I’m climbing behind him thinking, “Oh, man, what next?” It was amazing. 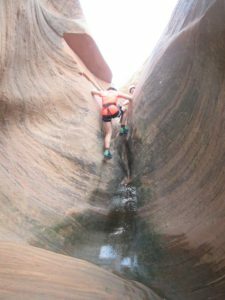 There were definitely times when I thought that my muscles would give out and I’d go from bridging to collapsing in a heap on the floor of the canyon. The floor of the canyon itself was uncertain, since rain levels and erosion change it all the time. So at one point M went first and, I kid you not, she started to wade forward and there was a drop-off and she disappeared under the muddy water. But even before the grown-ups had finished gasping, her blue helmet popped up like a cork and she was laughing. It was a favorite thrill of the trip. There was more crazy-athletic climbing and a bit of mini-rappelling down (here’s J). We finished with one big rappel–this is me halfway down while M plays in the water at the bottom. It was an adventure. Honestly, it was so awesome that if I were the girls’ age, I would probably be planning my future career as a canyon guide. Now remember, that whole excursion had been described as a light, fun, puddle-jumping sort of outing. 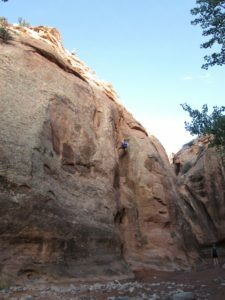 I realized later that the guy who’d been talking about it is a hard-core climber type, and Moab Desert Adventures seems to attract the people who are really into climbing. Like, the people who plan a vacation based on where they can climb. So in retrospect it makes sense that the description didn’t entirely match the experience. In a way, that’s good. I might have gotten scared away from my favorite afternoon of our whole trip. In contrast, the National Parks Service serves the general public, which includes the people who are too lazy to get out of their car at the Grand Canyon or so stupid that they decide to load a bison calf into their car in an ill-fated attempt to help it. 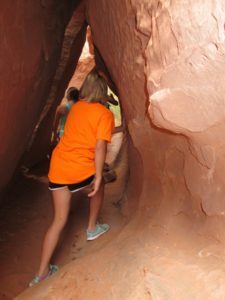 When we wanted to visit to the Fiery Furnace section of Arches National Park, we learned that there are only two ways to do it: either get a special permit, or go on a ranger-led tour. On the website, the NPS describes the tour as “strenuous,” but it doesn’t end there. They’ve also got a video which I couldn’t access just now, but I’ll tell you that I watched it from home and it left me pretty concerned about whether we’d be up for the challenge. We signed up, anyway. Then, on the day of the tour, which was the day after the canyoneering excursion above, we had to do this methodical check-in at the welcome station in which a woman reminded us of the many dangers and challenges ahead. Still flush with our victorious excursion from the day before and fortified by a full night’s sleep in a bed, we assured her that we were up for the challenge. Then we were told to watch a video that seemed primarily intended to scare people away. Okay. Then, the woman checking us in told us that we’d need two quarts of water per person. Now that was irritating. Our notes had said a minimum of one quart of water per person. More important, our recent experience hiking in Colorado and doing all sorts of things around Moab had shown us that one quarter of water per person would be more than enough. And most important, we didn’t have enough water bottles to fill to make up the difference between what we planned and what this lady said was required. We’d been using this big ol’ water bladder along with extra water bottles, and that had worked fine. But the place where the tour started was at least a twenty-minute drive from the welcome area (it’s a big park, yo), and we were worried that we’d schlep out to meet our ranger and she’d turn us away because we didn’t have the minimum amount of water. So we bought two extra (overpriced, stupid) water bottles at the gift shop and filled them up to make the minimum. Then, when we met up with the ranger, she asked, “Do you have water?” and we said yes. Did she say, “Do you have a minimum of two quarts water per person?” Why, no. She didn’t. She just asked if we had water. Crap. So we left the two brand-new bottles in our car, because water is heavy, you guys. And we’d heard that this hike was strenuous! 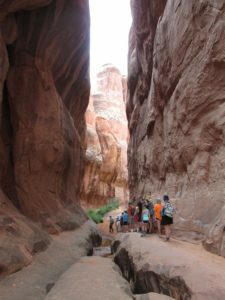 Our ranger was very good and the Fiery Furnace tour is an excellent introduction to the Moab landscape. Unfortunately, we’d already been introduced to the Moab landscape, and so what might have been super-cool when we first arrived felt like we’d gone from the honors course down to 101 level. We already knew how to stay on the slick rock to avoid the Biological Soil Crust, and the girls were not psyched to stay in a boring single file line. They resented having to just pass by the kind of cool nooks and crannies that they’d been joyfully exploring for days. People walked too slow, except when they walked too fast. Mostly it was just annoying to have to stick with the group. But what was the single most annoying thing about our tour? In a word, Linda. We understood, now, why there were so many admonishments to only proceed on the Fiery Furnace Tour if you were physically and mentally able to do so. Because even with all of those warnings, your trip could be marred by a Linda. Our park ranger gave us the schpiel before we entered the restricted zone of our special tour. We would need to jump, walk, climb, scootch, etc. Were we all absolutely sure that we were up for this? Because the group only includes one park ranger, so we’d need to stay together. Yes, said everyone. Yes, said Linda. We started the tour and before we’d gone a couple of hundred yards it was clear that one person had two bad knees, was not a great walker, was very concerned that she might fall and hurt herself. her name. . . was Linda. I know I sound like a terrible person. But you have to understand, the woman was bringing us all down. Folks from across the country and European locales had scheduled this tour months ahead of time and shown up in good faith and purchased overpriced water bottles for the privilege of exploring this special place, and this lady was clearly going to slow us all down. The park ranger paused and said something along the lines of, I usually don’t stop at this point, but I want to mention that if this is challenging for you, it will be about three to four times more challenging as we continue. And Linda nodded along with the rest of us. And the ranger gave her a Significant Look and she nodded along that she was still in. And all the rest of us nature tourists suppressed a sigh. Linda brought us to standstill multiple times. Even Cute W started to lose his patience, and that’s saying something. It happened when Linda lightly grazed her skin and demanded a bandage, then, once we’d all stopped while the park ranger fished one out of her first aid pack, she said that the ranger should really have better bandages, because these weren’t very good. Not, thank you for the bandage, but these aren’t great. At the risk of oversharing, Cute W and I had another continuing challenge this trip when someone’s, umm, elimination schedule kept conflicting with our tours in pristine natural areas. By the time we hit this tour I was fully prepared with giant baggies and wipes, but let’s just say I’m glad we left the extra water so I could reserve a little extra space in my backpack for, ummm, cargo. Ewww, I know. Aren’t mothers spectacular? And, finally, on the second pass by a fabulous-looking cranny, the park ranger gave the girls the go-ahead to explore, and they were psyched. So in spite of my moaning, I’d still recommend the Fiery Furnace Tour, either before doing something more spectacular or as an alternative if you or your family like your outdoor adventures a little less adventurous. For ourselves, we think that if we’d come back, we’d apply for a permit to explore on our own. The tricky part is that you have to apply in person a few days in advance. So if we planned a week in Moab (and I totally would), we’d visit the Arches welcome center right away in hopes of scoring a permit a few days later. Of course, I’d only do this with Cute W because my sense of direction is awful and the whole reason behind the permit requirement, along with conservation, is that the place is like a maze, so they want to keep track of everyone going in to make sure that they make it out. So he’d need a compass and I’d need him.